Did you recently receive a gThankYou! Ham Gift Certificate? Congrats! We hope you love sharing your ham gift with family and friends. Redeeming your Certificate is easy. Just choose any major grocery chain store in the U.S.
Redeeming your gThankYou! Ham Gift Certificate is easy! For the best service, we recommend choosing a traditional chain grocery store such as Kroger, Safeway, Shop-Rite, Publix or other similar types of grocery stores in your area. As you’re preparing for holiday celebrations with family and friends, download our gift to you — a FREE holiday ham cookbook. Did you receive a gThankYou! 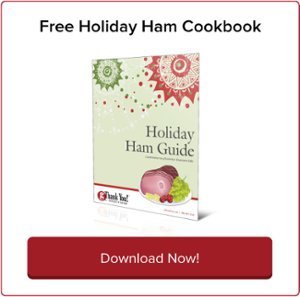 Free Holiday Ham Cookbook from gThankYou! There’s nothing like a delicious ham at the holiday table. With the help of our free Holiday Ham Cookbook, yours will be perfect! From purchase to presentation, this downloadable Holiday Ham Guide offers the details you need to serve a fantastic holiday ham with all the fixings. Free Thanksgiving Turkey Cookbook by gThankYou! Thanksgiving is a time to gather and enjoy family and friends. It’s our uniquely American holiday focused on giving thanks for the bounty of our lives. The focus is on celebrating sharing a feast with a much-loved turkey centerpiece…but what if you are not sure how to handle or cook the bird? It may not be summer yet, but it is BBQ season — so share your thanks by delighting employees with Ham Gift Certificates by gThankYou! When you think of barbecuing, ham may not be the first thing that comes to mind, but Food Network experts like Patrick and Gina Neely, stars of Down Home With the Neelys, swear by it. Plan Now for Summer Employee Thank You Gifts! Employee thank you gifts are appreciated anytime! With summer fast approaching, why not take advantage of the warm weather and joy of the season to share gratitude in your workplace? His research shows that gratitude makes a difference, and that people don’t require grand gestures, just heartfelt ones. National Pi Day is today – March 14, 2015! National Pi Day celebrates the Greek letter Pi (“π”) and the mathematics number, 3.141529… National Pi Day website says it is used as a ratio of a circle’s circumference to diameter, and it is particularly helpful because it stays constant for all circles. The perfect accompaniment to your gThankYou! Ham Gift Certificate is our FREE Ham Cookbook, “Holiday Ham Guide”! Whether you’re a ham novice or have served ham at family gatherings for years, you’ll find practical information you can use immediately to make your holiday celebration delicious, stress-free and fun. This Thanksgiving, serve your loved ones the perfect Thanksgiving turkey! Our FREE turkey cookbook, “The Ultimate Thanksgiving Turkey Guide” is chock-full of information making it easy and fun for you whether you are a first time cook or a seasoned pro. Use Your Turkey Gift Certificate On A Culinary Tour Of The U.S. This Thanksgiving, take your taste buds on a trip and try something new! Your gThankYou! Turkey Gift Certificate — redeemable for any turkey size, brand or type — is your ticket to a culinary tour of the United States. Spring celebrations include graduations, Mother’s Day, baptisms, and of course, religious holidays like Easter. It’s a time for healthy feasting to symbolize the end of a long winter and the beginning of a fresh new season. First, a universal truth: the best way to enjoy holiday ham leftovers may be straight out of the refrigerator, bits of crunchy glaze still clinging to the edges. But there is the old saying that eternity might be defined as two people and a ham. There’s a reason everyone hovers in the kitchen while Christmas dinner is cooking. Few things make the mouth water like a succulent holiday ham, pleasantly salty and covered in a sinfully sticky glaze. Right after Thanksgiving, you may be feeling all “turkeyed” out, and nobody would blame you. But Christmas is coming as quick as you can say “holiday sales,” and no one regrets planning early for holiday entertaining. Whether you’re an old hand at cooking holiday turkeys and hams, or a newbie in the main dish department, or even if you want to try preparing Chef David Burke’s dishwasher turkey, you’ll find great cooking tips and techniques in our FREE holiday turkey and ham cookbooks. Free Holiday Ham Cookbook by gThankYou! gThankYou! is happy to present our new free “Holiday Ham Guide,” just in time for your holiday menu planning! It is an informative read when you want ideas to plan the perfect ham. The goal with Thanksgiving, America’s favorite feast day, is always MORE: more turkey, more stuffing, more cranberry sauce. And lots more Thanksgiving leftovers, so we spend one busy morning cooking up a storm and enjoy the fruits of our labors for days afterwards. It’s Thanksgiving! Time for putting the final touches on your Thanksgiving dinner menu. For some people that means bringing out the tried and true Thanksgiving side dishes, the age-old recipes that have become standards for your family, whether they taste particularly good or not.